...Yes, that's right! 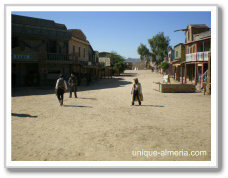 Mini-Hollywood is an area located in the Desert of Tabernas , Almeria, the only desert in Europe. Hundreds of celebrities and actors left their footprints here, like Clint Eastwood, Brigitte Bardot, Anthony Quinn, Claudia Cardinale, Alain Delon, Sean Connery, Raquel Welch, Orson Wells ... It was the paradise for Hollywood cinema for two decades, the 60s and 70s and the location for Sergio Leone movies. Presently there are three sites that are operated independently, that are open for visitors: the , Oasys Theme Park, Fort Bravo and Western Leone. 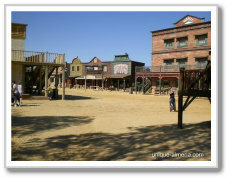 All of them offer a variety of the American Wild West attractions, some of them are still being used as film locations. This Western set represented the town of El Paso (Texas) in "For A Few Dollars More" and it also appeared in "The Good the Bad and the Ugly". 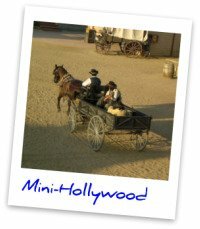 It is the largest Mini Hollywood site of all (and our kids are just crazy about it!). Apart from the Western Town it boasts a great pool area and a zoo! All included in the price. The ideal place to spend an entire day out with kids! Good value for money! Make sure you arrive first thing in the morning so you get the most out of the park. 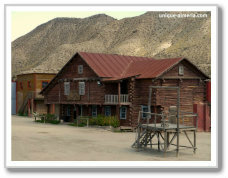 This Western town was expressly built for the shooting "The Good, The Bad and The Ugly" as additional decorations to the already existing Oasys Theme Park settings. Today one will find Fort Bravo almost in its original condition. 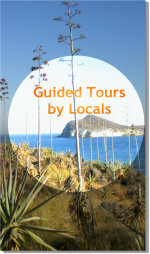 It is a Must See for all Western buffs. comprised of a saloon,jail, shops, bank and stables. It also boasts a Mexican area with a square, church, peasant homes and homesteads.You probably will have seen these decoration in many commercial spots, such as Pepsi etc. Here you will find the restored "Sweetwater" as it appeared in "Once Upon A Time in the West" in 1968. This little Western town, is still being used for film shoots. 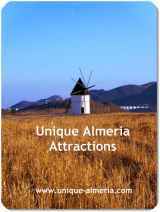 It also offers a cowboy show, western saloon and souvenir shop. By the time of writing, one of the actors currently working there claims to be the "secret" son of Henry Fonda! After having had a drink with him in the Saloon, I am convinced he is!! When coming to Mini-Hollywood, you should wear comfortable shoes, and on hot days sun protection and at least one bottle of water. I also recommend backpacking particularly if you are coming with children since there will be much walking waiting for you. Also, if you decided to visit the Oasys Theme Park, don't forget your swimsuit and towel because you may want to relax and cool off in the pool! Do you have a great story or advice about one of the 3 Western Theme Parks? Share it!